Phnom Penh – The Asian Development Bank on Monday dismissed accusations that one of its consultants asked Phnom Penh to act against groups monitoring one of its infrastructure development projects. 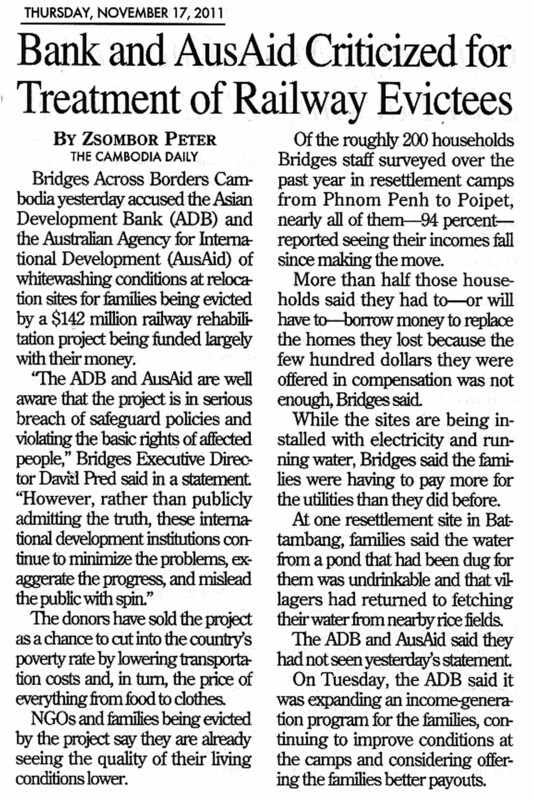 An internal investigation found ‘no evidence’ of any request for action against two rights groups that advocate for people affected by a 142-million-dollar railway rehabilitation project, ADB country head Putu Kamayana said. His comments contradict a June 17 letter from Minister of Finance Keat Chhon to Prime Minister Hun Sen, a copy of which the German Press Agency dpa has seen. 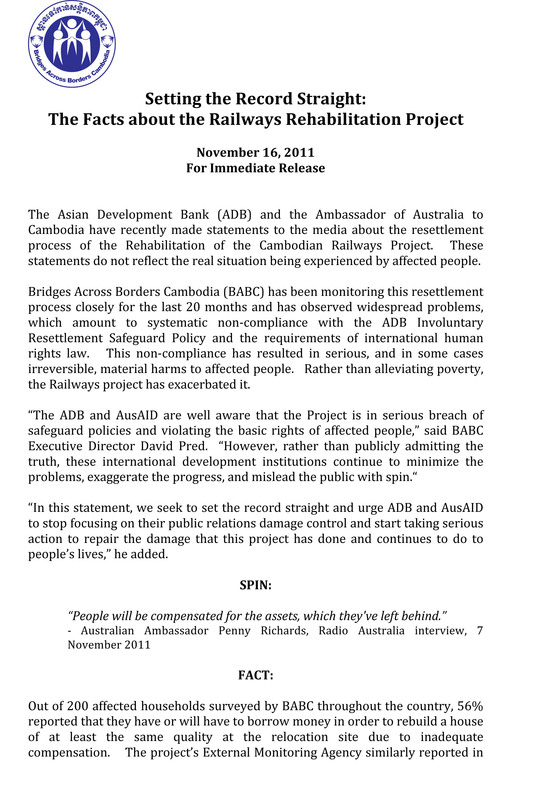 Keat Chhon wrote that an unidentified ADB consultant had asked the government to act against the groups STT and Bridges Across Borders Cambodia (BABC). 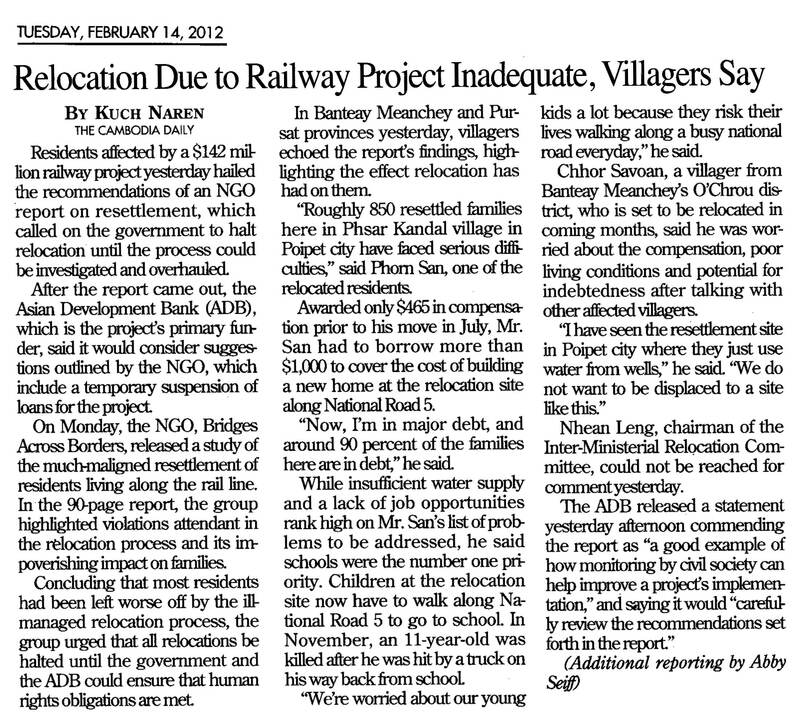 In his letter, the minister asked Hun Sen to ‘nullify (their) eligibility.’The ADB consultant has drawn the attention of the government officials to be careful with these NGOs, and requested the government take immediate action on this group of foreign NGOs because (the) ADB is also under political pressure caused by these NGOs,’ he wrote. Within weeks the government suspended STT for alleged paperwork violations, and warned BABC for ‘discrediting the government’ and inciting people against the government, a criminal offence. Two other groups monitoring railway resettlement were similarly cautioned. Keat Chhon also wrote that ‘local and international consultants’ from the ADB had said the main goal of the non-governmental organizations was to cancel the railway’s construction. Cambodia is rehabilitating its railway, which fell into neglect after years of conflict. When completed, the new railway will close the gap in the regional rail network and link Singapore to the city of Kunming in China. ‘No evidence was found to substantiate alleged misconduct by any ADB consultants,’ Kamayana said by email. However, the ADB earlier declined to provide a copy of its investigation report, saying dpa could apply for it through the bank’s formal information channels. A formal request on September 13 has so far not been answered. Kamayana said the ADB hoped the NGOs would be allowed to continue their monitoring work, which was ‘integral’ to the project’s success. In his letter, Keat Chhon also recommended banning any advocacy work by foreign NGOs and foreigners in local NGOs. He also said the government should rapidly pass and implement the controversial draft NGO Law. The bill has riled some donors and hundreds of civil society groups who say it will impose burdensome restrictions on NGOs, and increase the power of the government over them. Keat Chhon’s letter carried an annotation from Hun Sen on June 19 approving its contents. Keat Chhon and staff at the finance ministry could not be reached for comment. Officials at other ministries declined to comment. 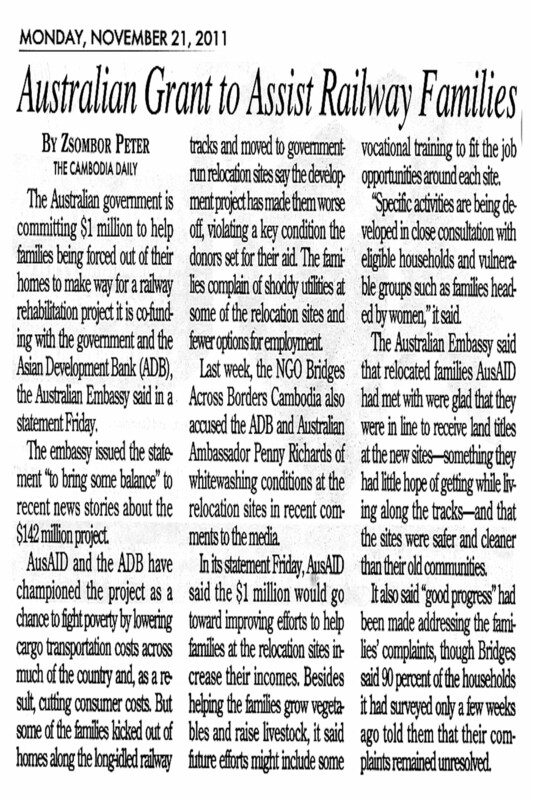 The ADB has provided 84 million dollars for the railway rehabilitation project, while the Australian government’s development arm AusAID has provided 21.5 million dollars. 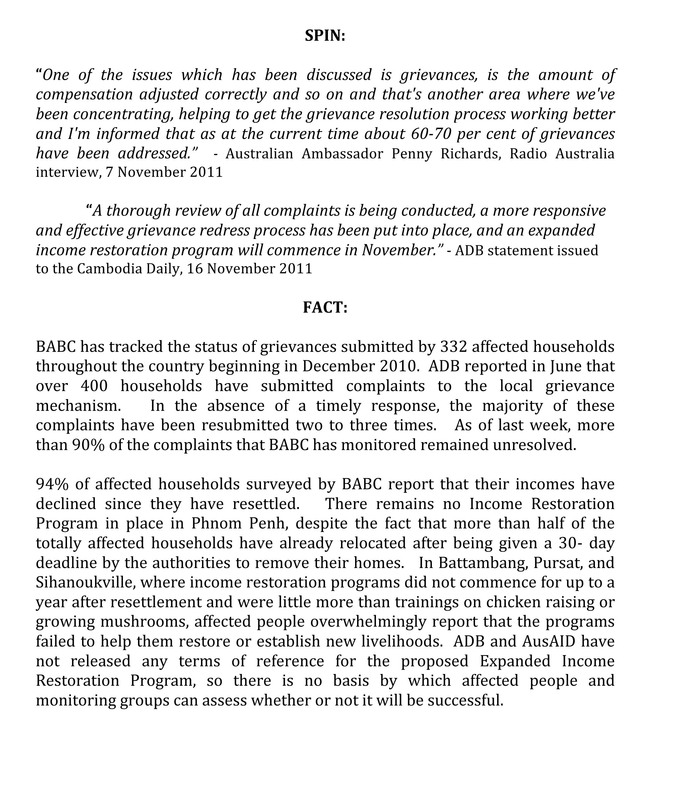 STT and BABC have worked for nearly two years with villagers facing resettlement under the rehabilitation. ADB rules say people who are resettled must not end up worse off. 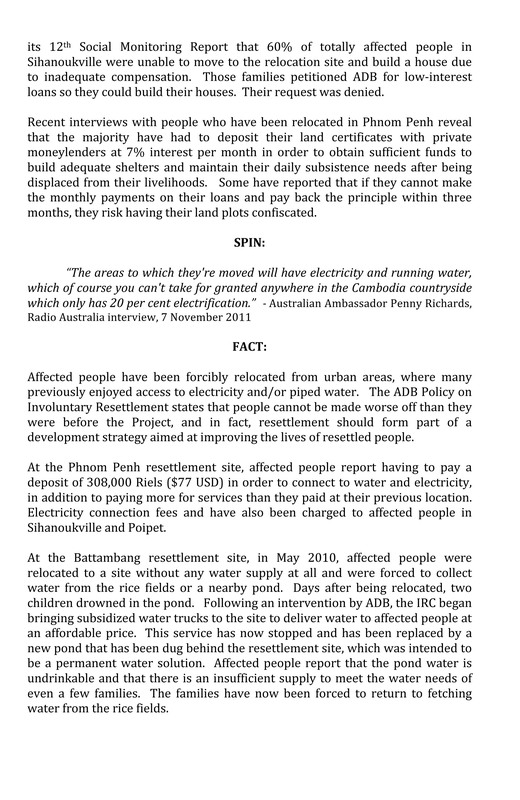 In a letter to the ADB last year the groups targeted by the government criticized conditions at a resettlement site where two children drowned. David Pred, BABC’s executive director, said by email that the ‘dire circumstances’ of many resettled families showed the bank’s consultants had failed in their duties. Referring to the June 17 letter, he said he was ‘deeply disappointed’ that ADB consultants appeared involved in actions against the NGOs. The authorities have crossed swords with STT and BABC before, notably over the groups’ advocacy on behalf of villagers at the controversial Boeung Kak lake project in central Phnom Penh, which is being developed by a prominent ruling party senator. In March, the World Bank suspended lending to Cambodia after a slew of evictions at the lake saw thousands of residents displaced with what rights groups said was inadequate compensation.